Excel-də tarixə əsaslanan hüceyrələri necə qoruyursunuz? Normal olaraq, digərləri hüceyrə dəyərlərini düzəldən və ya dəyişdirməməyi maneə törətmək üçün iş səhifəsini qoruyuruq, ancaq bəzən hüceyrələri tarixə qorumaq lazımdır. Məsələn, digər hüceyrələri qorumaq istəyirəm, ancaq bu günkü tarixin hüceyrə dəyərlərini aşağıdakı ekran görüntüsü kimi dəyişdirmək üçün icazə verin, bu maddə, tarixə əsasən hüceyrələrin necə qorunması barədə danışacaqdır. MsgBox "Only today's date row can be edited! ", vbInformation, "Kutools for Excel"
Qeyd: Yuxarıdakı kodda, məktub E tarixi olan sütun başlığıdır "111111"Bu hesabatı qorumaq üçün parol. Onları ehtiyaclarınıza dəyişə bilərsiniz. 2. Sonra bu kod pəncərəsini saxlayıb bağlayın. Qeyd: Yuxarıda göstərilən kodda nömrə 5 tarixi olan sütun nömrəsi, "111111"Bu hesabatı qorumaq üçün parol. Onları ehtiyaclarınıza dəyişə bilərsiniz. 3. Sonra bu kod pəncərəsini saxlayıb bağlayın. As someone who is relatively new to VBA, would you mind explaining why xRow = 2 in Line 4? This works great. but how can I switch it to unlock a column based on dates in row 3? 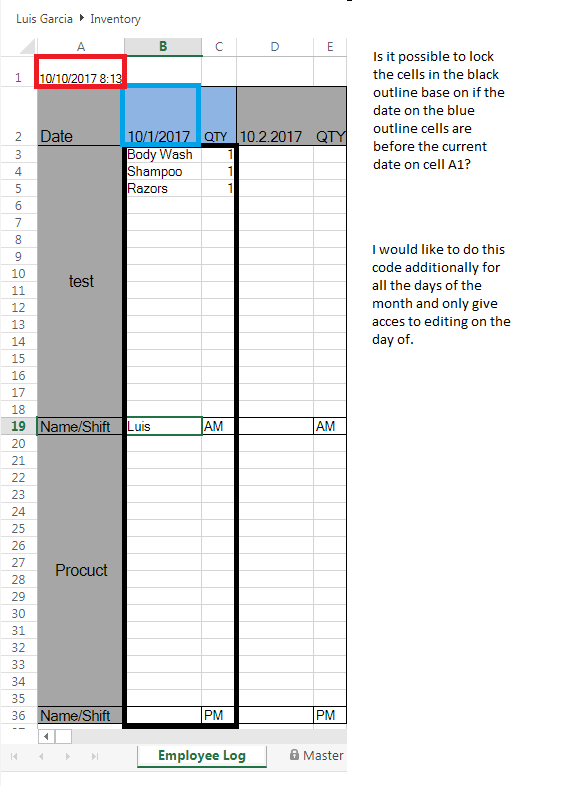 hi is it possible to lock certain cells depending on the date that is directly above them in a column? Can you give your problem more specifically? Or you can attach a screenshot as your problem. Yes here is a screenshot. Hope this helps. Do you mean to lock the columns which date is past, and only the columns of today and future days can be modified? Correct! How would I go about that? How about the date cell in A1? Is it entered manually or entered with a formula =now()? If it is a formula cell, the locked columns will be changed with the date changes. yes the cell A1 has the =now() formula. Hi is it possible to lock columns by the date directly above the columns?